Tomorrow night, we'll be at the Point After (located within the Sports Mall). There will be a live band, dancing, a raffle with awesome prizes, and of course, the pool tournament. 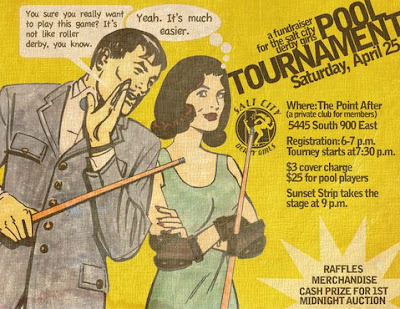 Cover charge is $3 and registration for the pool tournament is $25. First place takes a cash prize. Last year, this event was a blast! The art work for the flier above was created by the Leave it to Cleavers own England's Glory!